汉斯洛普公园（Hanslope Park）：郊区的米尔顿凯恩斯政府通信中心（英语：Her Majesty's Government Communications Centre）大楼，隶属于外交部和英国情报网络. ^ Intelligence and Security Committee of Parliament Annual Report 2012–2013 (PDF). 2013: 40 [29 December 2013]. ISBN 978-0-10-298652-5. ^ Whitehead, Jennifer. 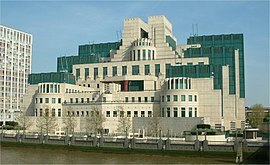 MI6 to boost recruitment prospects with launch of first website. Brand Republic. 13 October 2005 [10 July 2010]. ^ Ian Cobain and Richard Norton-Taylor. Sins of colonialists lay concealed for decades in secret archive. The Guardian. 18 April 2012 [25 June 2012]. ^ Richard Tomlinson. The Big Breach: From Top Secret to Maximum Security. Mainstream Publishing. 2001. ISBN 1-903813-01-8. Davies, Philip H.J.（2005）'The Machinery of Spying Breaks Down' in Studies in Intelligence Summer 2005 Declassified Edition. Seeger, Kirsten Olstrup (2008) 'Friendly Fire'（DK）ISBN 978-87-7799-193-6. A biography of the author's father who was a member of the Danish resistance during the Second World War.